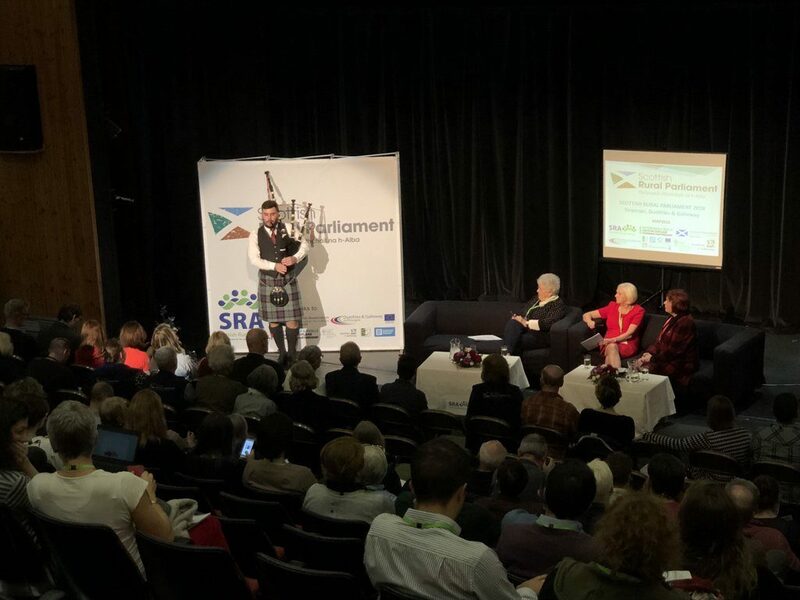 A Welsh delegation coordinated by PLANED recently attended the Scottish Rural Parliament to celebrate remarkable rural communities, discuss future challenges and demonstrate the strength and potential of rural areas. Jessica Morgan and Liz Bickerton attended the SRP, and were partly funded by a project called ROAD which brings together partners from Wales, Scotland, Northern Ireland, the Irish Republic and England to demonstrate their commitment to European relations and having a voice for rural areas in Europe. Jessica Morgan, LEADER Manager at PLANED said: “The Scottish Rural Parliament brings together people from rural communities with decision-makers, providing opportunities to share ideas, consider issues and debate solutions. Participants examine a wide-range of issues affecting rural communities and make recommendations for change. This Rural Parliament is particularly pertinent in the context of Brexit. A workshop was held to discuss maintaining links with Europe. The findings of the workshop and deliberations from other engagement mechanisms in each country will feed into a report by the end of February 2019. A final report will be presented at the European Rural Parliament gathering in Spain in November 2019. The Scottish Rural Parliament (SRP) was held in Stranraer, Dumfries and Galloway from November 14th – 16th 2018. This is a biennial event, with the first Scottish Rural Parliament held in 2014. The rural parliament concept originated in Sweden in 1989. There are now 13 national rural parliaments held in 12 countries across rural Europe. The European Rural Parliament, (ERP) works with national rural parliaments to influence and inform on a pan-European level. ERP is a long-term campaign to express the voice of rural people in Europe and to promote self-help and action by the rural people, in partnership with civil society and governments. ROAD is funded by a Civil Society programme of EACEA (Education, Audiovisual and Culture Executive Agency).